Doug Ford smiles at supporters after the Progressive Conservatives win the Ontario election June 7. The party, led by the former Toronto city councillor, is headed for a majority government in the 124-seat legislature. With more than 98 per cent of polls reporting, the PCs had won or were leading in 76 seats and the NDP had won or were leading in 39 seats, according to Elections Ontario. The Liberals were leading in seven seats and the Green Party in one. Voter turnout was more than 57 per cent, higher than other recent elections in the province. 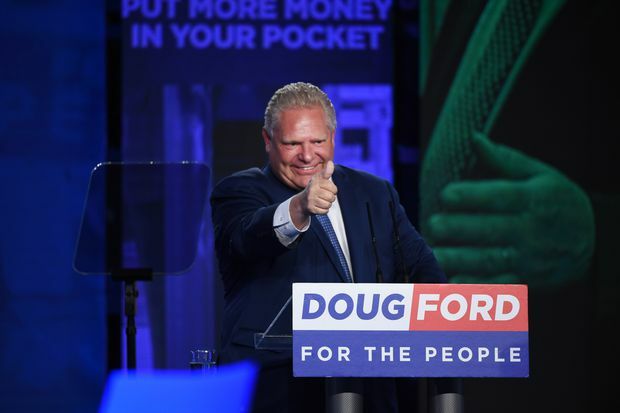 Progressive Conservative Leader Doug Ford, who had not previously sat in the provincial legislature, won in Etobicoke North. New Democrat Leader Andrea Horwath was re-elected in Hamilton Centre, which she has represented for more than a decade. Liberal Leader Kathleen Wynne had a narrow lead in her Toronto-area riding of Don Valley West over the PC candidate. Many of her former cabinet ministers were defeated. Green Leader Mike Schreiner won election in Guelph. It is the party’s first seat in the province. 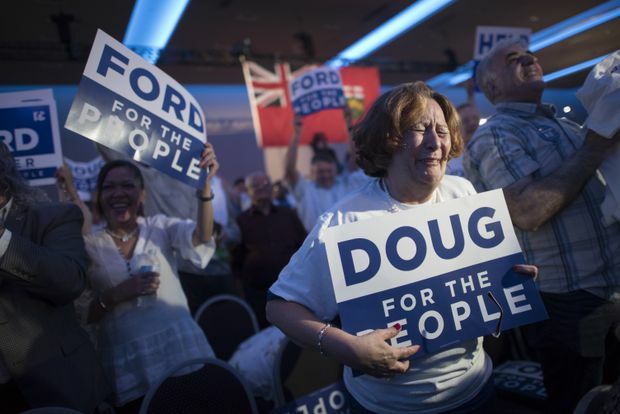 A Ford supporter is overcome with emotion after hearing election results broadcast at the Toronto Congress Centre where Ford's election rally was being held on June 7 2018. The room erupted in cheers shortly after the polls closed as CP24 declared a PC win and then, moments later, a majority for a party that has not held office in Ontario since 2003. Tony Clement, a federal Conservative MP who was at Mr. Ford’s victory party, said the Tory Leader ran a disciplined campaign and adhered to his message about high hydro rates and the high cost of living, despite all the distractions. “I think the message actually broke through some of the other chatter on the campaign,” he said. Mr. Ford shouted over the cheering crowd when he emerged to give his victory speech. “Thank you so much, my friends,” Mr. Ford said. Andrea Horwath, leader of the Ontario New Democratic Party, reacts after provincial election voting closed, in Hamilton, Ontario, Canada June 7, 2018. After making her way to the podium surrounded by a crush of supporters and cameras, with her campaign bus as a backdrop, Ms. Horwath told the crowd she was proud of the “positive vision” her party offered Ontario. 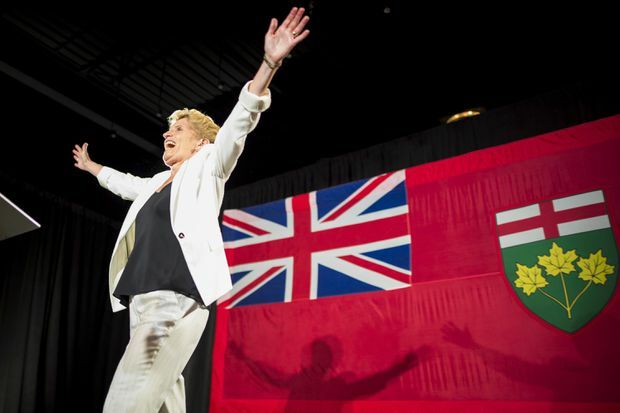 She said the party convinced millions of Ontarians and elected more seats than the party had in a generation, as the crowd erupted in cheers. NDP adviser Kim Wright said the party’s disappointing results may have to do with underperforming candidates in Southwestern Ontario, where New Democrats needed a breakthrough to pull off any kind of an upset. “We needed to do better in that Highway 401 corridor,” Ms. Wright said, adding that doubling the seat count was still a positive result for the NDP and Ms. Horwath, who she said many voters started to see as a potential premier during the campaign. Kathleen Wynne emerged just before 10:30 p.m. to address the crowd at the York Mills Gallery. She was introduced as the MPP for Don Valley West. The excited crowd of supporters cheered as an emotional Ms. Wynne thanked her supporters. “You’d never know it from that, but this is a difficult night,” she said, joking about the Shania Twain music that she walked out to. Though their victories remained in the single digits, Liberal supporters were pleased with Ms. Wynne’s win – and their ability to hang onto eight seats and maintain their party status. “This is not a concession speech,” Ms. Wynne said, noting she’d acknowledged she wouldn’t win days ago. Instead, she said it was an opportunity to thank the group for allowing her to be premier for five years. She also said she was resigning as leader of the Ontario Liberals. She has had the position since 2013, and the party has governed Ontario since 2003.